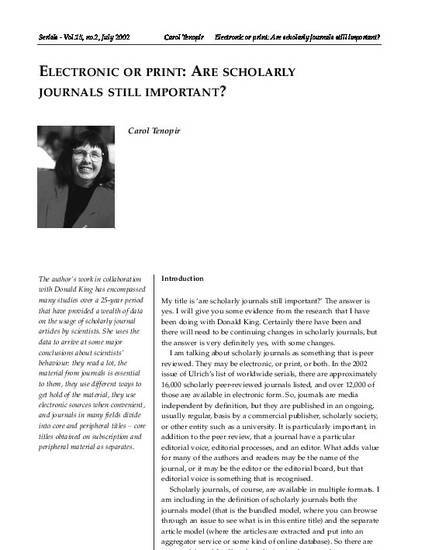 Electronic or Print: Are Scholarly Journals Still Important? The author's work in collaboration with Donald King has encompassed many studies over a 25-year period that have provided a wealth of data on the usage of scholarly journal articles by scientists. She uses the data to arrive at some major conclusions about scientists' behaviour: they read a lot, the material from journals is essential to them, they use different ways to get hold of the material, they use electronic sources when convenient, and journals in many fields divide into core and peripheral titles - core titles obtained on subscription and peripheral material as separates.